Beauty might be in the eyes of the beholder but when it comes to the these two ladies there is no argument how stunning they are, there is just admiration. In today’s social media world, the pretty ones have a say and reign supreme. It helps to also have a good phone camera but filters can only go so far in enhancing beauty, sometimes your facial features have to corporate. 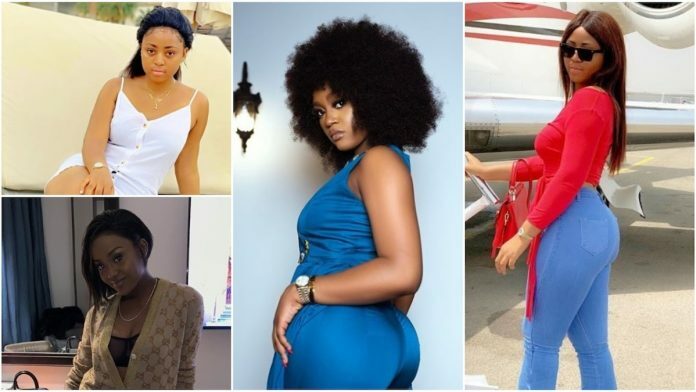 Just for being pretty faces and Nigerian celebrities by definition of job and the other for her boyfriend, Regina Daniels and Chioma aka Chefchi are famous on social media. Easy to believe that their lives are super fabulous and because they are in the public’s eye a lot they make sure to look flawless on the gram. Good thing they have the fans and followers to welcome their new looks which naturally has their male fans drooling. While Regina style seems to be that of the pretty girl next door, Chioma goes all out in showing she is grown, sassy woman who is ready to take on the world with her beauty and appeal. Career wise, the two ladies have made their mark as far as the entertainment industry is concerned. Regina is a celebrated Nollywood star and Chioma is a budding chef who is working on her cooking show. Happiness is free. . . True or False? Who should wear the crown?